ASUS has announced next-generation E8 series servers based on the Intel Grantley platform and designed to deliver extreme efficiency, expandability, enhanced-usability design and complete remote management for premium performance in datacenters, high-performance computing (HPC) and enterprise, as well as small and medium business (SMB) environments. ASUS E8 servers feature premium components for premium efficiency with up to 94% VR efficiency and better-than-ever thermal solutions. Additionally, a design makes better user experience and friendly usage – quick initialization guidance and Port 80 LED provide clear system initialization status. Flexible expandability offers diverse range of applications including storage and networking. Through ASUS remote management solution, users could save time and effort on server management and easy maintenance. The ASUS RS720Q-E8-RS12 features four nodes, eight CPUs and up to 64 DIMMs, offering up to 112 cores and a peak performance of 4 TFLOPS. You also have a neat-and-tidy cable placement for optimal cooling efficiency and heat dissipation. The 1+1 flexible expandability with one low-profile PCI Express 3.0 x16 slot, plus one proprietary PCI Express 3.0 x8 slot ensures easy expansion. The RS720-E8-RS24 Series offers high speed 2U storage capacity and flexible OS placement with both M.2 slot and rear SSD bays available. It also features advanced heat dissipation with individual fan group fan speed control, providing the best power efficiency. For expansion, we have three PCI Express 3.0 x16 slot, one PCI Express 3.0 x8 slot, one PCI Express 3.0 x8 slot with MIO support. 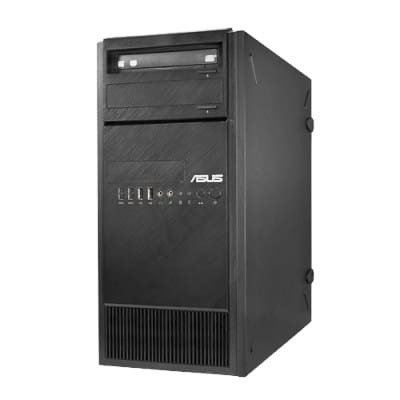 The ASUS RS700-E8 Series offers a rack-optimized design with optimal cooling efficiency and heat dissipation with parallel CPU and memory placement. It has 2+2 Flexible expandability with OCP module support and Supreme Power Solution. The ASUS RS520-E8 Series offers mass storage and flexibility in 2U with hot-swappable 12 SAS/SATA 2.5/3.5-inch disk drive bays. It also features advanced heat dissipation with adjustable fan speed, offering flexibility to meet different working environment. It also supports optional ASUS PIKE II (Proprietary I/O Kit Expansion) HBA card and 10G LAN Card. The RS500-E8 Series offers high-efficiency cooling with optimized fan speed control and adjustable fan-curve. You also get one PCI-E Gen3 x16 slot, one PCI-E Gen3 x8 slot, one PCI-E Gen3 x8 slot Mezzanine card for OCP applications. The exclusive tool-less rail kit design makes for easy system deployment for administrators in the workplace. The RS400-E8-PS2 Series offers a short-depth case for great efficiency and density. The short-depth (15.7-inch) rack server for flexible placement and front I/O design, allows users to easily access the I/O ports from the front panel. ASUS announces new range of next-generation E8 series servers 0 out of 5 based on 0 ratings. 0 user reviews.